Sitting on banana leaves on the floor of a smoke filled kitchen, Rosaline Ngum mutters something as I approach her. I stretch out my hand for a handshake, but she politely tells me, "I'm not allowed to shake hands with people.’’ A close look at her eyes conveys clearly how much sorrow has encompassed her whole being. 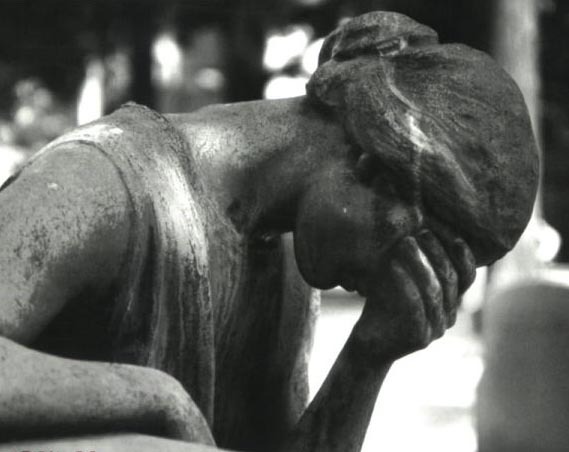 "After moving with my husband from hospital to hospital for close to a month, he died, leaving me and the kids without a word,’’ she laments in Pidgin. She tells me she has not had a change of clothes nor taken a bath for a week now, since the day her husband died. "She would clean her woman skin (meaning her private parts) on the day of the corpse removal, then we would dress her up with a black gown, which she would wear for one year," said an old woman sitting on a bamboo stool beside the widow. "We would help her with the cleansing rituals immediately after her husband is buried," she went on. "It’s our tradition. Our forefathers practiced it and we must continue. If we do not respect this tradition she would become mad". Despite the intense campaigns in the media and in churches against the ill-effects of noxious widowhood practices in the North West Region of Cameroon, the practice continues to thrive, imposed by the older women on the younger generation in the name of maintaining tradition. The wife is often held responsible for her husband`s death, even in the case of proven illness. It is still common in most villages to find widows stripped naked, sleeping on bare floor for weeks, being rubbed with unpleasant substances, not shaking hands or sharing items with people except other widows. Widows can also be forced to marry one of their in-laws, to preserve family control of their late husbands' property, and be forced to drink the water that was used in washing the corpse. According to Mama Susana Ndandoh of Awing village, these practices are a test of the woman`s fidelity to her late husband and a cleansing ritual to free the woman from the curses that come along with disobedience. Unfortunately the tradition has led to ill treatment and gross psychological torture of women at a time when they need comfort the most. 23 year old Delphine Andam says, when she lost her husband she experienced the worst form of torture she ever experienced in her entire life. "For three weeks prior to the final cleansing ceremony I slept on the bare floor and had no bath nor change of clothes. Since then I developed a terrible back ache which has persisted for three years now,’’ she laments. In Baba Two village, the widow is undressed, and her entire body is shaven clean of hair, using crude tools, such as broken bottles and rusted blades. She then walks bare footed, sleeps on plantain leaves on the floor and eats on leaves. On the day of the final death celebration, she is expected to move on her buttocks round the courtyard of the celebration ground with a loin tied just beneath her breast, singing and crying. One of the older widows in Baba Two village told me they have decided to modernize the tradition by not making the widow stay stark naked. In Alatening village the widow is encircled by older widows who dance the "Nkou" by moving around her, gently stripping off her clothing until she is stark naked. She is then taken to a shrine where a ritual bath is conducted. However some families, influenced by modernity or Christianity, do not go to such extents. Clodet Azah told me she refused performing the widowhood rites when her husband died because she is a Christian, according to her it is unscriptural for such practices to be carried out on widows, and anything contrary to scripture is demonic. She says the members of her Christian women`s group helped to protect her from being persecuted by her in laws. She believes no curse can work against her for not performing the ritual because she is protected by Jesus. Mama Mofor of Awing village told me she locked herself up in a room and threatened to deal with any woman who came near her for the ritual. She says the next day two of the women came to her and asked to conduct her own privately, if she was ashamed to do it in the open. Mama Mofor protested that the ritual is a hollow tradition. If it had any real power, the roles would be the same for everyone. Though she refused, she says nothing ever happened to her for defying the tradition. According to her the women engage in such practices for personal benefits like keeping the widow's dress and jewelry she wore the day her husband died and receiving all the gifts offered to the widow during the period of mourning. It is interesting to note that in most cultures here in Cameroon, men are subject to few or no rituals when they lose their wives. In some tribes the man is given a new wife to prevent the late wife's spirit from disturbing him while sleeping at night. All this to ensure the man's comfort. Unfortunately, the practice has left many of its victims with serious health complications like hypertension, due to psychological shock, backaches resulting from sleeping on the bare floor, and lung infections due to inhaling of smoke in the kitchens which are often used as confinement zones for widows. The unsanitary practice of using a single razor to shave the widow, her co-wives and children could be an easy means of spreading the HIV virus. Other widows have suffered miscarriages due to the rituals, malnutrition bordering on starvation, anemia, and skin rashes. And some widows have lost their lives due to sicknesses they developed while indulging in this practice. So far the state has not been able to provide a tangible solution to this problem. The law stipulates punishment (10 years imprisonment and a fine of 1 million FCFA) for anyone who indulges in the tradition of wife inheritance, described in law as "levirate marriage". Unfortunately due to lack of education and insufficient exposure to the law, women continue to suffer dehumanizing traditional practices. Superstition plays a great role in plunging the women into the clutches of inhuman traditional practices, and even some highly educated women participate in such practices in the name of maintaining the African culture. Efforts by NGOs and international organizations to dissuade the women from this ritual have so far yielded little fruit. Churches have so far been the most successful in liberating the women from this tradition. Mrs. Fomuso Mary, president of the Christian Women Fellowship group of Presbyterian Church Ntamulung, with a membership of over a thousand women, estimates that one out of every five women in the North West Region is widowed. "It would be very difficult to eradicate such a phenomenon using manmade laws, since women are generally a very spiritual set of people. A more trusted spiritual law than that of the African tradition would be the best weapon for this fight, and to the women of the North West Region, that would be Christianity," Fomuso explained. According to Rev. Kenji Zephaniah of the Mezam Presbytery of the Presbyterian Church In Cameroon, the church through the Christian women fellowship group is doing its best to protect its members from any form of torture in the name of widowhood. Kenji says when a member loses her husband, the church group stays by her side until the funeral rites are over to ensure she is not mistreated in any way.